Jellyfish, flamingoes, butterflies; pandas, zebras, vipers. This beautifully illustrated oversize compendium will be a treat for anyone who likes to look at and think about the staggering variety of animals on this planet. Davies (‘King of the Sky’) has a degree in zoology and a clear passion for animal life. Paintings, poetry, and lyrical prose celebrate animals of all sorts...Horácek uses a variety of materials including wax crayon, acrylic and watercolor paints, and cutouts. The vibrant color and texture may remind some of the work of Brian Wildsmith. Each section ends with a spread of fast facts: characteristics of different animal groups; spots and stripes; parasites; eggs; and animals using tools. A treasure for readers of any age who delight in the natural world. Davies and Horacek offer a striking poetic and visual tribute to the animal world. The book’s generous size and heavy, glossy pages provide an excellent showcase for the mixed-media artwork. The very large, colorful illustrations are impressive, and Horáek uses the space well, offering striking images of many species...Kids intrigued by animals will enjoy the art while absorbing some information along the way. At first glance, this oversize volume is extraordinarily eye-catching...Each lyric may lead kids to seek out more information, and teachers could use the book with older students to demonstrate how poetry can convey information. Styles move from the delicate glory of a dizzying array of beetles to a pack of expressionistic wolves to a cloud of silky, skeiny, nearly abstract jellyfish. While elementary readers may enjoy poring over this title on their own, its most satisfying use will be a listener’s choice or section-at-a-time readaloud so viewers can gaze at the art uninterrupted while somebody else transmits the text. 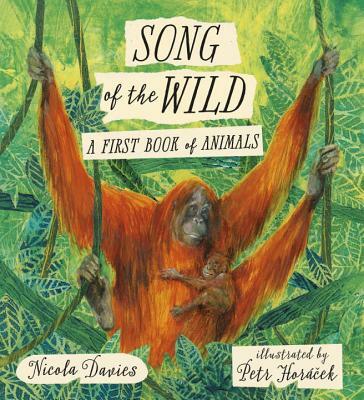 The text by Nicola Davies is wonderfully variegated, sometimes rhyming and always fresh and interesting… Petr Horacek’s artwork is fabulous here: rich and vivid and full of touching, observant detail that draws the eye again and again.